Background: Coronary Computed Tomography Angiography (CTA) has become one of the most important diagnostic imaging modalities for the evaluation of coronary artery diseases. During coronary computed CTA, sufficient vascular enhancement is essential for the accurate detection and evaluation of lesions in the coronary arteries. To obtain optimal contrast enhancement and perform appropriate clinical coronary CTA, physicians, radiologists, and radiology technologists should acquire a basic knowledge of contrast injection protocols. Conclusion: This review article summarizes the basic concepts of contrast injection protocols for coronary CTA. Keywords: CT angiography, computed tomography, ECG, physicians, radiologists, radiology technologists. Keywords:CT angiography, computed tomography, ECG, physicians, radiologists, radiology technologists. Abstract:Background: Coronary Computed Tomography Angiography (CTA) has become one of the most important diagnostic imaging modalities for the evaluation of coronary artery diseases. 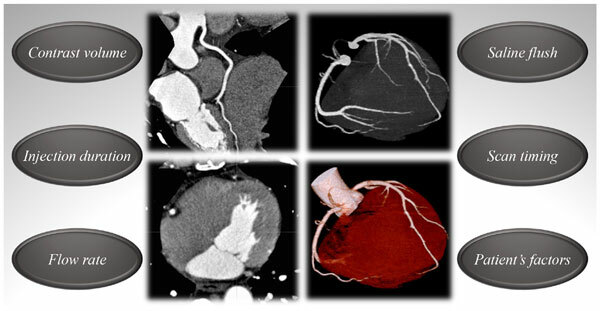 During coronary computed CTA, sufficient vascular enhancement is essential for the accurate detection and evaluation of lesions in the coronary arteries. To obtain optimal contrast enhancement and perform appropriate clinical coronary CTA, physicians, radiologists, and radiology technologists should acquire a basic knowledge of contrast injection protocols. Cardioprotective effects of Aronia melanocarpa anthocynanins. From laboratory experiments to clinical practice. ATP Binding Cassette Transporter A1 (ABCA1) Associated Proteins:Potential Drug Targets in the Metabolic Syndrome and Atherosclerotic Disease?